Before you take a look at this beautiful setup, I suggest y’all check out my introductory post on the Weekly Winner to guide you with my trading framework. Darn! No love for the euro last week! None at all! 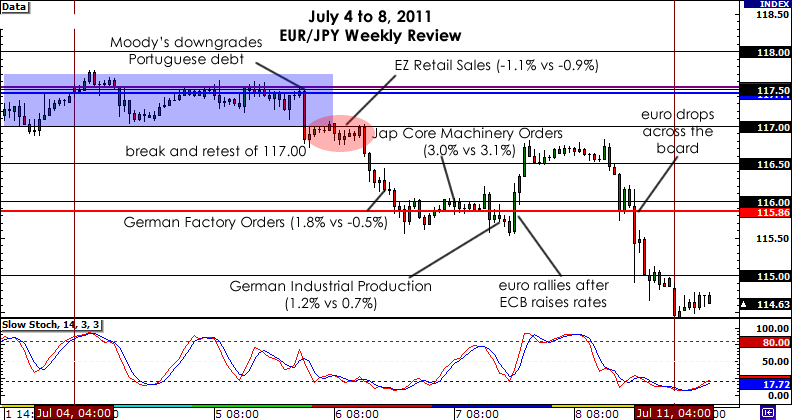 The week started off normal enough as the euro was straight up chillin’ between 117.00 and 117.50 and trading sideways. But late Tuesday night, things started to get a little more interesting. Moody’s decided to downgrade Portuguese debt to junk status, and this caused EUR/JPY to finally break out of its 50-pip range. The sucker broke the 117.00 MaPs and retested it from the downside before it consolidated around the next MaPs (116.00), in the area of the WATR. The euro did find relief from the selloff after the ECB raised interest rates on Thursday, but that rally was short-lived, and it wasn’t long before EUR/JPY was on its way to forging new lows. So how could we have capitalized on the bearish sentiment on the euro? Well, one way we could’ve grabbed a quick 2:1 winner was by playing the break and retest of 117.00. By Wednesday, 117.00 had already established itself as a solid support level, so playing the break (or break and retest) was definitely justified. We had a chance to short at 117.00 itself and set our stop about 50 pips away (in the area of the WO and PWH). Now, from there, we had to option to take profit at the next probable support level, which was in the area at 116.00 and the WATR, which would’ve given us a quick and easy 2:1 trade. On the other hand, if we had more conviction in our trade and held on until the end of the week, when price hit 115.00, we could’ve improved our reward-to-risk ratio to 4:1! Not bad at all! This week, I’m hoping to chalk up a big winner as both the euro zone and the U.K. are set to publish potential market-movers. Which cross pair do you think I should trade?